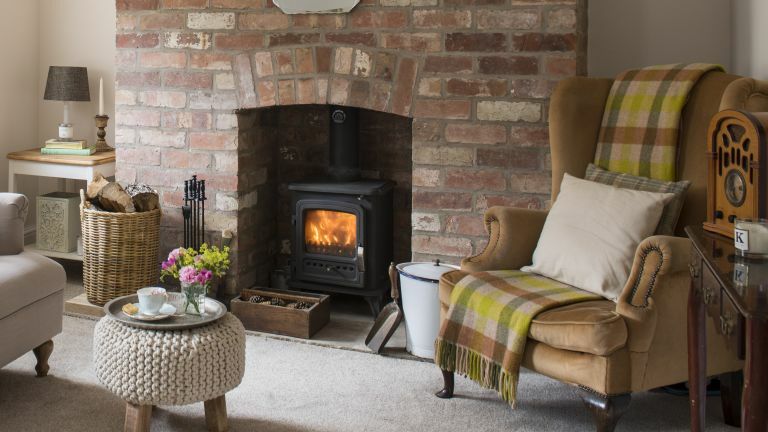 We've put together a guide to how to clean and maintain a woodburning stove, using expert advice from DIY expert Helaine Clare. For more cleaning tips and advice, take a look at our dedicated hub page, too. Only start cleaning stoves that are are cold. If soot and tar deposits have migrated through the plaster from the brick chimney breast, brush away dirt and apply a coat of stain block. If necessary, apply a second coat two hours after the first one has dried. Once dry the surface can be overpainted with any type of paint. To remove rust patches from a woodburner, cut a pad of medium grade steel wool to rub away the rust and, wearing protective gloves, gently work away at it until it vanishes. With a brush and dustpan sweep up the mess, and use a stove brush or clean shoe brush to clear dirt off the surface ready for painting. First mask the glass doors and metal handles with newspaper and tape. Protect the walls and hearth, too, if you are painting the whole appliance. Before applying the paint, open doors and windows to ensure good ventilation. Hold the can about 25-30cm away from the surface and spray the damaged top of the stove. If stoves have sooty windows, it can indicate that they are not burning efficiently. To clean, wipe the window with stove glass cleaner, leave for five minutes, then remove with a damp rag. Clean a sooty window on a wood-burning stove with wood ash applied on a damp cloth. Rub away the soot and then wipe with a clean cloth. Over time the rope seal around the door will flatten and lose its shape, affecting the stove's efficiency and allowing fumes to leak out. Set a small fire and close the doors and air intakes. Move a lit candle around the door – if the flame is drawn towards it a poor seal is indicated and the rope needs replacing. Clean out the firebox and empty the ash pan. Shine a torch inside to check that the firebricks are not broken. Leave the air inlets open and the door ajar to allow a flow of air through the chimney to keep it dry. Arrange to have the chimney swept too. Seal a slate hearth to enhance the colour and make it easier to clean. First sweep up loose dirt and ash, then with heavy-duty floor cleaner and hot water scrub the hearth, mopping up the water as you work. Wipe over with clean water and dry with an old towel. Leave for at least four days before applying sealer. Some stone care products mustn’t be used where the temperature is likely to exceed 25ºC so always read the guidance on the product. Slate oil will repel dirt and ash while still allowing the slate to breathe. Before you start protect rugs or carpet from splashes. Apply evenly with a brush or sponge and allow to dry for two hours. Looking for more cleaning advice and inspiration?